Use this virtual terminal that you can access from anywhere, to process transactions in person, over the phone or through the mail. 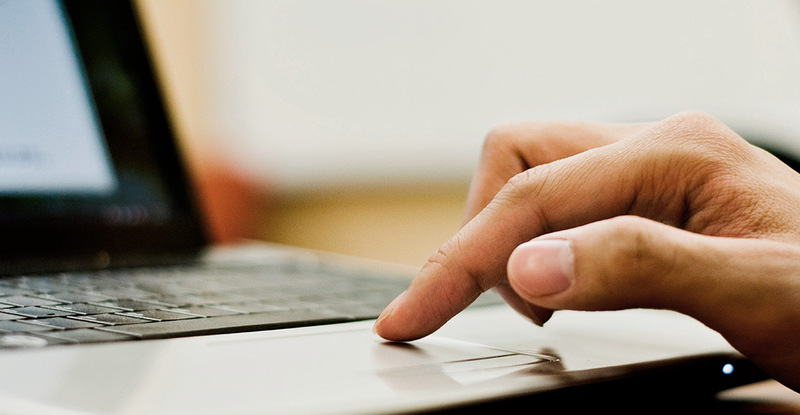 Using any Internet-connected PC, you can process payments anywhere, anytime. And with no software to download or lengthy installation process to wait for, you'll enjoy the prompt processing of payments directly from your home or place of business. With TSYS WebPASSSM, you'll have recurring payment capabilities, multi-user features, available reports 24/7 and the convenience of integrating our plug-and-play card readers to process face-to-face transactions. Your business – and your clients – will be protected from fraud with real-time processing, data protections and verification code support. Credit card data is transmitted with the highest levels of encryption and security protocols, and compliance updates are seamlessly integrated into the application, with no action required by you. TSYS WebPASS receipts may be printed on properly configured Windows printers. Please be sure your printer is connected to your computer before trying to print a WebPASS receipt. **EMV transactions available only on computers with Window OS, IE browsers and the latest version of JRE plug-in. ***Please note, Windows XP, Windows Vista and Windows 8 operating systems are not supported. ****Most recent version required; use the browser's auto update feature to remain current. TSYS WebPASS is a browser-based payment acceptance solution used to securely process credit card transactions. It is accessed through compatible Internet Web browsers, bringing all of the functionality of a traditional point-of-sale terminal to your personal computer. TSYS WebPASS supports credit cards that are both present and not present, as well as credit card transactions that are coupled with a compatible card reader. Cardholder data is collected and submitted for processing using virtually any computer connected to the Internet. Can I board my own merchants via an online interface? Yes. You can complete file builds and perform maintenance for your merchants through Merchant Center. What equipment do I need to process with TSYS WebPASS? You will need a computer that meets the minimal requirements, a high-speed Internet connection and a compatible card reader if you wish to accept face-to-face transactions. All major credit cards are accepted, including Visa, MasterCard, Discover, American Express, Diners Club and JCB. Signature debit is accepted; however, PIN Debit is not supported. What other transaction types are supported? TSYS WebPASS also supports recurring payments, voids and returns as well as industry-specific transactions such as level III, tips, recurring payments and convenience fees. What fraud features does TSYS WebPASS provide? TSYS WebPASS offers Address Verification System (AVS), Cardholder Identification (CID) and Card Verification Value (CVV2) verification services. It’s important to remember that all cardholder data is stored at a secure host, not on the PC processing the transaction. For ultimate security, purchase an encryption-enabled card reader* and enjoy the benefits of point-to-point encryption – the new industry standard in fraud prevention. How long does it take to process a transaction? A typical transaction processes in mere seconds when using the recommended high-speed Internet connection. Can multiple employees use TSYS WebPASS? There is no limit to the number of employees who can be granted permission to process transactions with TSYS WebPASS. Each employee will be assigned a unique user ID and password to access the program. Can I process batch files from TSYS WebPASS? Yes, TSYS WebPASS does allow for batch files to be uploaded. Do I need to batch out every night? No, TSYS WebPASS automatically sends batches out every day from the secure host server. A custom auto settlement time can be set by the merchant services provider upon request. 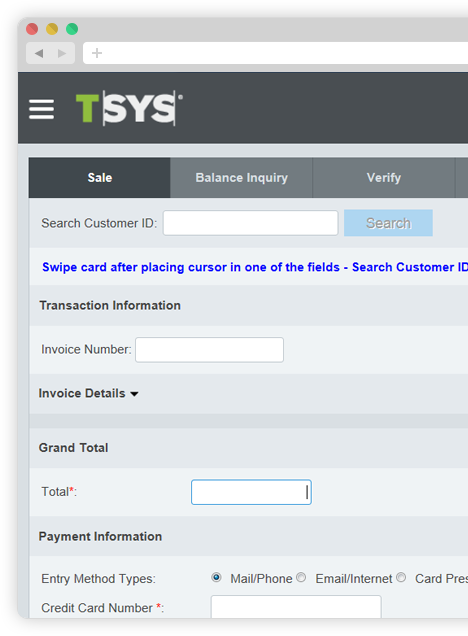 Who can I contact if I have problems with my TSYS WebPASS application and hardware? Your TSYS WebPASS support team is available to answer questions and resolve issues seven days a week, 24 hours a day.